After publishing blog posts about major Elementor releases, like Template Library and Mobile Editing, today’s update is a smaller one, but includes a new feature that was requested directly by all you lovely Elementor fans out there. Time and time again, people sent us support tickets regarding getting a page to be full width, meaning span from right to left, with no spacing in the sides. At first, we recommended moving to themes that supported full width, like GeneratePress and Pojo Themes. Then, we recommended using the Elementor Templater plugin made by WPDevHQ, which added full width page templates even if the theme doesn’t allow for them. Now, we have a simpler solution – A new control that we have added to the panel itself, which helps create a full width page in WordPress. While we still recommend using your theme setting to get full width, this option lets you get the full width effect without having to make any alterations to the theme or the CSS of the page. To use the ‘Stretch to Full Width’ feature, go to Section > Layout > Stretch Section and switch it to ‘Yes’. We’ve added another option that lets you control how the stretch behaves, but this is a more advanced feature that requires some CSS knowledge. If this gets you confused, just skip to the next paragraph. In the Elementor Admin Dashboard, we have added a field that lets you assign a selector to which the full width will stretch to. For example, you can enter #Wrapper, and then the full width will stretch to the wrapper id. To read more about full width check out this documentation article. Another useful feature we have added is the ability to set a different width for the content area in your section, that will be implemented for every section you create. Let’s say that the content in your site is 900 pixel wide, instead of manually setting the content width of every new section to match the existing design, you can now customize Elementor’s default content area width for all your sections, in one global setting. Go to Elementor settings page, under ‘Style Settings’ > ‘Content Width’ you can set the default width of the content area. This feature is the easiest way to create a full width page in WordPress. 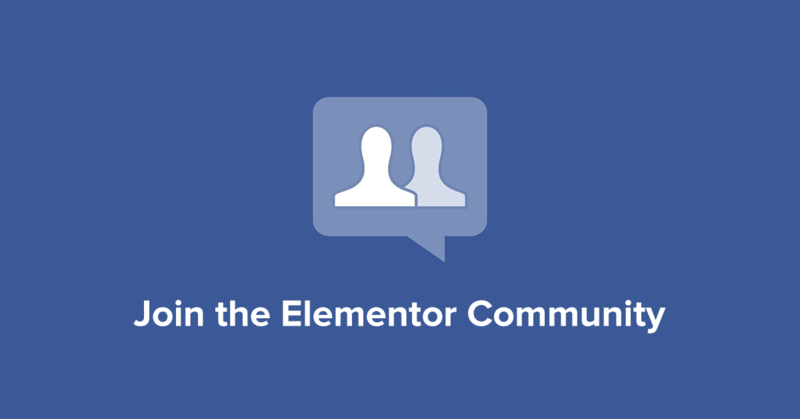 There is a brand new Facebook group, Elementors, started by Mike Costantini, which comprises of avid Elementor users who love using our page builder. We have already seen some great questions posted there, and it appears as if a strong Elementor community is starting to grow there. We invite you to join the group, ask questions, and even help others with their own questions. We hope to see you joining the conversation. Elementor is growing fast, and we are constantly adding new features and capabilities. These additions also add new controls and features that need to be translated into the various languages Elementor has already been translated to. Luckily, Elementor has gotten a lot of help and support from translators, coming from all over the world, that have translated it to over 13 different languages. Because we have added so many cool new features, we now need more help from translators to update the translations for languages that now fell to being only 80% translated. If you want to be a part of Elementor’s success, log in and contribute to the translation in your language. All translation is done online, so anyone with the proper language skills can contribute. To see the entire list, visit the translation page. We have written this guide explaining the first steps in translating Elementor. 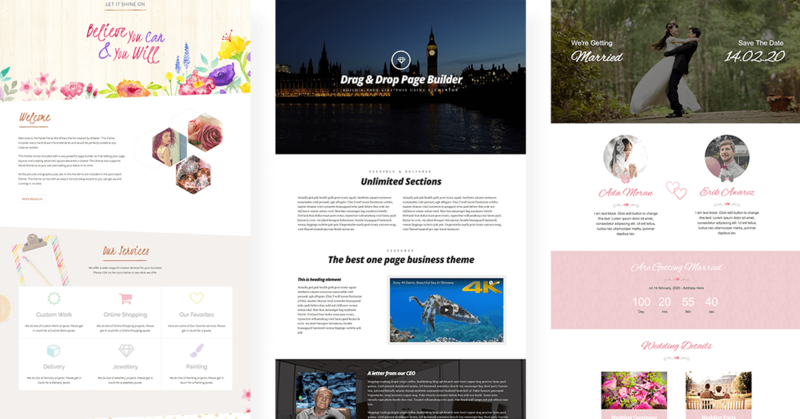 Theme developers are starting to acknowledge the power of our page builder, and have started implementing it in their free and premium themes. We encourage this initiative, and think it is a great growth factor for Elementor. Imagely ran the most comprehensive comparison we have seen to date of top page builders. Elementor stacked up nicely, I must say. Notably, Elementor is the only free page builder tested on the list. Adam from WPCrafter was kind enough to include us in his comparison of page builders. Tom Rankin of GraphPaperPress wrote about us in an article that is beautifully titled: We Love WordPress Page Builder Plugins! Brian Jackson ran a speed test on Elementor. Here are the results. We just can’t get enough of WPTuts tutorials, this week on our Mobile Editing feature. Great nifty feature. And Ben thanks for featuring my free wedding layout. Elementor is awesome. Awesome news Ben and the team. Now I’m currious on the theme at ThemeForest though! Do they have the plugin embeded in to the theme or just including support for Elementor? And, do you have any news on the developer API? Z-I’m still going to use your plugin because it gives the option of Menu or Not. That is good for different scenarios. Thanks Ben, Elementor certainly getting better and better. See HUGE potential. Although with the latest update, the icons in the Editing are missing. Also I’m experiencing issues with the Entrance Animations, that are basically playing or animating twice on page load, in all browsers and on my mobile phone. I notice the same happening on your demo page for Entrance Animations. Any ideas? Can you send this to us at support [at] elementor dot com? I can also attest that Elementor cures migraines. Yes, seriously. I have spent the last 2 days studying and playing with the new DIVI builder. So, many options. So many choices, my head was spinning. Did not build 1 single page. Elementor is like jumping into an auto-piloted Ferrari in comparison. Gets you where you want to go fast, and in style-Along with the best “mechanics” that keep things humming smoothly. So glad you guys came along when you did. Met you on LinkedIn. Thanks for mentioning the Imagely post. I put a lot of hard work into that one! Great thing the full stretch. i will definitely use it. thx Ben. Munir, The file for download is json. Can I upload it to wordpress and change it to my requirement ? Please make a good, “native” highly customizable theme for the Elementor! I am ready to pay for it. (50$<) I would be a great alternative to Divi at last. I am having compatibility issues with Elementor and Internet Explorer. I used one of the templates without a single modification (the agency one, but same result with the others). I used Internet Explorer emulators available on the web. Do you know if there are known compatibility issues of Elementor with Internet Explorer 9 and below? Loving Elementor so far. And thanks for this article – addressed one of my early challenges. You guys are awesome! Having an issue with the latest update… When I add the 1st section it’s too high and you can’t click it to edit it. I can see the bottom of it but that’s it. Even with adding just one new section to a blank canvas puts it much to high to even delete it. I tried it with a couple of themes and it’s doing the same thing. This might be because of the theme you have installed. Please update to the latest version of Elementor and if it persists contact us at support at elementor dot com. Seems The Stretch Feature Removed. We can not able to set section width to full or box. Hi, When I am using elementor on blog post page, it’s not showing up full width page. I have selected and tried elementor full width option under post attribute(template) setting. Elementor is working fine on my website pages but not on blog post page. Any help? Something is wrong with this section currently on 4/9/2019. Please have a look at it. If I turn on the stretch section than the screen is acting weird. the width is very long and it is not fitting in responsive screens.